The Ginseng Oolong Tea - This is an invigorating blend of oolong tea and ginseng. Oolong teas are known for their orchid-like aroma and lingering sweet aftertaste. They're also effective in alleviating or preventing indigestion. Research also suggests that they may help to lower cholesterol levels. Ginseng has long been renowned as a medicinal herb. It's frequently used for enhancing physical and mental endurance, strengthening resistance to stress and fatigue, boosting the immune system and revitalizing cell activity. A lot of research has also focused on the properties of ginseng which seem to aid in preventing heat disease, because it helps to lower blood pressure and cholesterol. Ginseng may also stop the growth of some cancerous tumors. Oolong tea is mixed with ginseng roots to produce a delicious tea that nourishes your body and replenishes your energy. 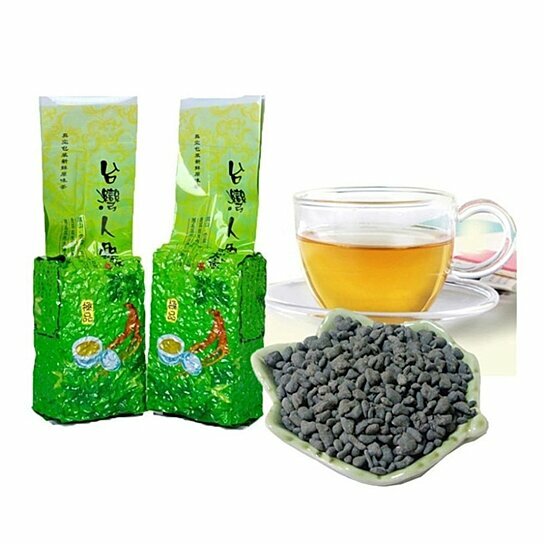 This tea has a rich crisp oolong taste with a stronger pleasing ginseng aftertaste.